Home » News » Don’t Take Flea and Tick Prevention for Granted! Recent studies have shown that Chagas disease, a single-celled parasite spread by an insect sometimes known as the “kissing bug”, is well-established in Texas, and that it’s here to stay. While the number of diagnosed infections over the last twenty years has been less than 1,000, it’s important to keep in mind that around 40% of those infections were diagnosed after the dog died. Not all new diseases are as fatal or devastating, and this isn’t to say that Chagas disease will become a problem in the US. The take-home is that new diseases will emerge in North America, especially given the increase in pet travel and climate change. What’s looming ahead, and what are we doing about it? 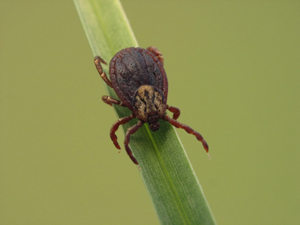 The veterinary world is already keeping a close eye on Lyme disease, ehrlichiosis and anaplasmosis, three diseases spread by ticks and prevalent in certain regions in North America. Leishmaniasis, a protozoal parasite spread by sand flies, is generally associated with places like India and the Amazon basin, but it has occurred in the United States and could become more of a problem. Fortunately, it’s still rather rare. Then there’s babesiosis, a malaria-like disease; bartonellosis (spread by fleas and ticks), a bacterial infection: cytauxzoonosis, spread by ticks. . .
You may have noticed that the common thread here is that these diseases are spread by arthropods (“bugs”). Not all diseases are, of course, but many are, and these few should provide incentive enough to keep up with your flea and tick prevention. Remember that your veterinary visit isn’t just for vaccines and a physical, it’s for education. Keep reading the news as well. There’s no reason to become obsessive, but part of being a responsible pet owner is keeping abreast of current developments—six months to a year in between appointments is a long time in the world of medicine.